Product prices and availability are accurate as of 2019-04-19 15:45:22 UTC and are subject to change. Any price and availability information displayed on http://www.amazon.com/ at the time of purchase will apply to the purchase of this product. This is a well built tactical vest. Designed to take allot of abuse. Made from 1000D high density nylon. Full MOLLE front, back and sides. 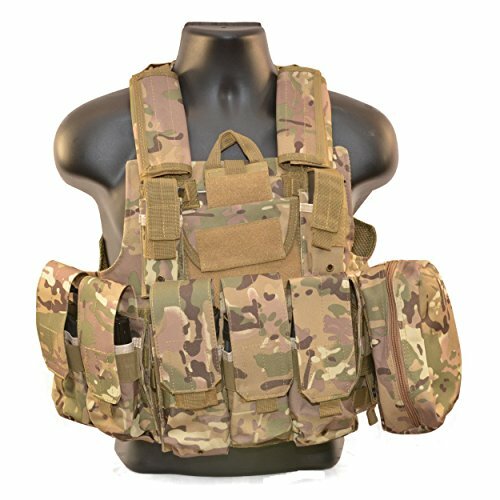 This vest comes with 1 triple magazine pouch M4/M16, 1 double magazine pouch M4/M16, 1 map pouch, 2 flashlight/Pistol Clip Magazine, 1 medic pouch, and 1 radio pouch. Fits: Chest 41'' to 48'' / Height 5'7'' to 6'5''. This vest is equipped with a single point pull cable quick release system for emergency removal and also features front and back drag straps/handles. DHL FAST DELIVERY3-5 WORKING DAYS:Fully loaded combat strike molle systems. Made from 1000D High density Nylon. Heavy duty construction. 6 rows of 1" straps on the front side and 8 rows of 1" straps on the back side of the vest. Velcro and elastic cumberbun for tight secure fit. Adjustable shoulder straps with padding for comfort Includes all pouches and accessory holders shown in photos. 1 triple magazine pouch. 1 double magazine pouch. 1 map pouch. 2 flashlight/Pistol Clip Magazine. 1 medic pouch. 1 radio pouch. 1 medic pouch. 1 radio pouch. Mesh inside the front and rear of the vest for maximum breathability.